We might take it as a given that our hearing aids are scarcely visible, can be operated with our smart phones, and can differentiate between speech and background sound. What we may not realize, however, is that those capabilities are the results of 400 years of experimentation, design, and enhancement. Even 5 years ago, hearing aids could not provide the clarity of sound generated today. To understand why, let’s follow the history of hearing aids—starting today and moving in reverse—to see how hearing aids would have handled your hearing loss in four different years: 2016, 1985, 1940, and 1650. It’s 2016 and you’re looking to address your hearing loss. You open up a web browser, search for a local hearing care professional, fill out a brief form, and arrange an appointment. At your hearing assessment, your hearing is examined using state-of-the-art computer technology that precisely measures your hearing. Then, with the help of your hearing specialist, you pick out a hearing aid that meets your needs from a vast range of models. Then, your hearing expert programs your new hearing aids to enhance only the sounds and frequencies you have trouble hearing, bringing about crystal clear sound without distortion. If you were to tell anyone in the 1980’s that this would be the process, they wouldn’t have thought it was possible. So what did make it possible? In essence, digital technology. For the majority of their history, there was no way for hearing aids to differentiate between assorted sound frequencies. Hearing aids would magnify all incoming sound, including background noise, creating distorted sound. The digital revolution cleared up that challenge. With digital technology, all information can be changed, stored, and manipulated as permutations of 0’s and 1’s. Digital technology made it possible for hearing aids to transform sound frequencies into digital information, which could then be grouped in accordance with which sounds should be amplified (speech) and which should be restrained (background noise). The first all-digital hearing aid was created in 1995, and since then the technology has improved dramatically, ultimately to incorporate wireless functionality. Now it’s 1985 and you’re seeking to treat your hearing loss. You can forget about browsing for a local hearing care provider on the web because the first commercial internet service provider won’t be established until 1989. You’d need to use the yellow pages, rely on referrals, or drive around the neighborhood to find a hearing care practice. After scheduling an appointment and having your hearing analyzed, your options for hearing aids are very limited. Without the microprocessor and digital technology, hearing aids were built with a sequence of transistors. This adds size and higher power requirements, resulting in larger batteries and larger hearing aids. Additionally, without the advantage of digital technology, the hearing aid cannot distinguish between different frequencies of sound. Hearing aids receive inbound sound and the transistors behave as simple amplifiers, amplifying all sound. So if you’re in a loud area, speech recognition will be virtually impossible. It’s 1940 and you’re contemplating acquiring a hearing aid. Transistors haven’t been applied to hearing aids yet, so your options are limited to vacuum tube hearing aids. Vacuum tubes utilize more power than transistors, so the hearing aids demand larger batteries, making the hearing aids big, heavy, and awkward. And once again, without digital technology, the hearing aids can only act as basic amplification systems, making all incoming sound louder. The hearing aids can’t enhance speech and cannot remove background noise. Let’s travel all the way back to 1650. There’s no digital technology, no transistors, and no vacuum tubes. As a result, there is no way to convert sound into electrical currents that can be amplified. With electrical amplification unattainable, your only alternative is mechanical amplification by concentrating and compressing sound into the ear, as with what happens when you cup your hands around your ears. 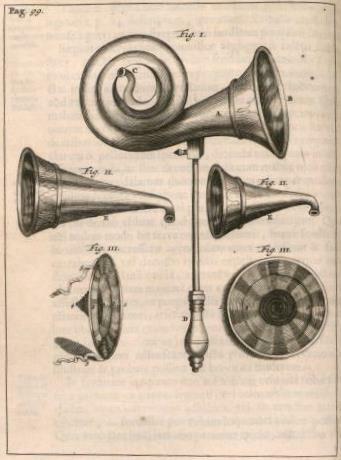 By 1650, devices were developed that focused inbound sound into the ears, and these contraptions were called ear trumpets. They were large gadgets with a conical end that picked up sound and a narrow end that concentrated the sound into the ear. This would be the only technology obtainable to individuals with hearing loss for the following 250 plus years. Let’s return to 2016. Throughout more than 400 years of history, hearing aids have evolved from mechanical amplification devices to electrical amplification devices, from vacuum-tube-based to digital-based. They’ve become significantly smaller, lighter, and more effective and affordable. They’ve also become much better at distinguishing between different types of sound, and in amplifying only selected kinds of sound (such as amplifying speech while repressing background noise). Every generation of hearing aid has generated a significant enhancement over the previous generation. The question is, what’s the next major milestone in the history of hearing aids? Will we eventually be able to improve natural human hearing, rather than simply restore it?